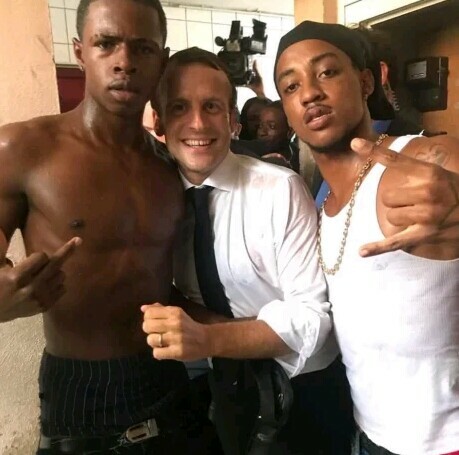 French President Emmanuel Macron has been attacked after a picture of him posing with two bare-chested men with one of them flipping the middle finger surfaced online. During his recent trip to Saint Martin to inspect the reconstruction work after the Caribbean island was devastated by hurricanes Irma and Maria last year, Emmanuel Macron spent quality good time with the locals affected by the tragedy. He was pictured alongside two shirtless young men, with one of them showing the finger at the cameras. The second bandanna-wearing man reportedly told the French leader that he was a “robber” and was recently released from prison. The French president then advised the ex-convict to move forward and contribute to the reconstruction of the hurricane-stricken island. The president who wasn’t fazed by his confession then told the young man to leave his criminal past behind and take part in reconstruction. Meanwhile, the image of the trio which has now gone viral, have been generating heated debates among social media users as well as fellow politicians from Opposition parties. “Words cannot express our indignation. France certainly does not deserve that. It is unforgivable!” she tweeted.